Setting up a limited company, and starting to contract, does not have to be complicated. But there are steps that you should follow, once you have looked at the tax options, and decided which is the most advantageous to you. This may seem like a strange question, but it's vital that you understand exactly what a limited company is, before you start on the process of setting one up. The most important thing to remember is that any limited company you create is separate to you personally. You need a separate bank account in the name of the company, and any profits or debts are held in that company name. When you first set up the limited company, it has to be registered at Companies House. One of the first things you need to do is decide what to call the limited company. Remember to decide on a name that is relevant and that is not going to become obsolete should you decide to expand into other areas in the future. You also need to decide which other people are going to be part of the limited company with you, and distribute shares to them. If you choose to use the ordinary shares distribution method, any dividends paid out any dividends that are paid are directly in proportion to the number of shares issued. This is not the case if you use preferential share division. This type of division has specific rules, and tax implications. If you want to use preferential share division it's often a good idea to seek professional assistance. You can choose to have other shareholders for your limited company. If you do this it's important to remember that you can only sell shares relative to the amount of capital in the company, and that you have to pay stamp duty when you sell shares. As soon as you have made the initial decisions regarding the setting up of the company, you should make sure that you register the company with Companies House. They will check if the name you have chosen is unique. They also provide a set of forms to complete that make the registration process simple. You need to assign a Director and a Secretary for the company; they can both be the same person if necessary. You will need to pay a small fee for setting up the company. You will also need to register a Memorandum of Association with Companies House. This document included details of what the company does, and how it's going to be run. As this document is likely to be referred to if there is a tax or legal dispute, it's often a good idea to get professional help with completing it. Do not forget to create a bank account in the company name, as the company has to operate as a separate entity. The major high street banks should be able to help, and there are also online options available. Remember to take time to do plenty of research, so that you make the best choice for the needs of the company. If you have an accountant for your company, they may be able to deal with all your VAT issues for you. But, it's actually not that complicated to deal with VAT registration and calculations you. When you first register for VAT, it can be a while before you get issued with your VAT registration. During this period it's important that you tell clients that you will need to back bill them once you have the registration in place. The final point that we are going to cover in this article is that you do not have to do all of the work yourself. You can seek help from a company formation specialist. They have the experience and expertise to put to use, to make sure that the formation process is smooth and successful. You may also want to hire an accountant to deal with all aspects of the company's accounts, including tax issues. You do not have to do this, but it can be useful along the way. Hopefully, you should find this information useful when setting up a limited company. Do not forget to keep records of the expenses incurred during the set up process, as they can be claimed back against company revenues in the future. There are a number of business structures and you should take professional advice to ensure you choose the one that is the best for your business and circumstances. 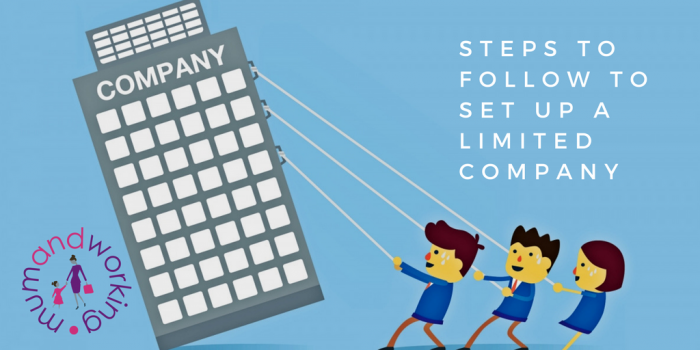 The follow is a guide on what should be amongst your considerations for a limited by shares company structure.